Valentine’s Day flowers are often associated exclusively with red roses. That floral variety and color are, by far, the most popular. Last year, in fact, more than 233 million were produced! As a result, many florists focus on the traditional red rose arrangement as their primary offering for the holiday. You’ll find a wide variety of Valentine’s Day flower arrangements and options that include this traditional romantic offering. No matter what choice of flower or color that you decide to give for this special holiday, you can’t go wrong when you pair it with candy. To build on that quintessential combination, we’ve incorporated candy into the actual floral arrangement and prepared a tutorial to show you how you can create your own flower arrangement for Valentine’s Day. 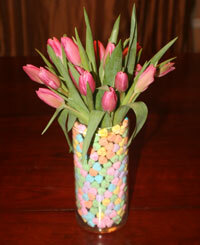 You can choose whatever flowers you desire and match it to a candy that complements the colors in your blossoms. Choose a vase and then find another container that will fit inside. You need enough space between the two for your candy to fill the void. 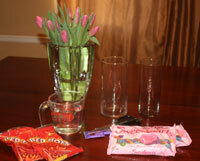 You can use a drinking glass inside your vase as long as the lips of both containers are of similar height. 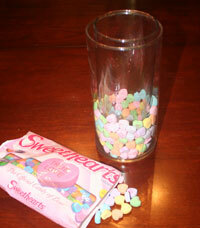 Fill the space between the two containers with candy. Among pastel-colored choices are traditional conversation hearts, petite nonpareil mints, Jordan almonds or hard-coated chocolate candies (such as M&Ms). Or choose solid red- or pink-colored candies, such as red-hot cinnamon candies, gummy bears, red licorice bites, sour cherry balls, raspberry drops, Swedish fish, jelly beans or wrapped taffy pieces. In a separate container, mix water with flower food following the directions on the flower-food packet. 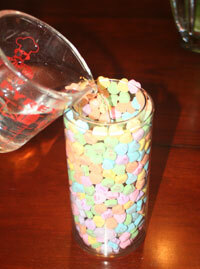 Carefully pour this liquid into the inside vase. Trim your Valentine’s Day flowers to the appropriate length. You can determine length by holding a flower upside down next to your vase. Measure how high you want the flowers to extend over the top of the vase and trim the stem at that height. Then cut all your stems to match. Remove any foliage that will be underwater from each stem. 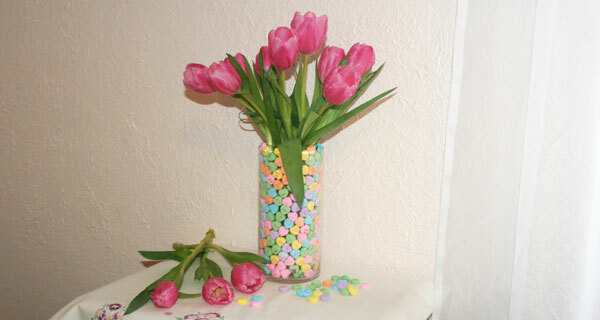 Insert each flower stem individually into the vase. Crisscross the stems to create an internal framework that supports the stems. Fill in with additional flowers as needed. Make sure your loved one keeps their Valentines flower arrangement away from heat vents or bowls of fresh fruit. The heat will dry out the flowers, and the fruit will emit an odorless, colorless gas that is nontoxic to humans but lethal to flowers. Add water to the arrangement as needed, every one to two days. Trim the bottom of each stem when you add water to ensure the bottom doesn’t become mushy, which impedes the uptake of water. Of course, you don’t have to limit the gift of flowers to only one day a year. Research proves that people love to receive flowers any time of year. So whether you are giving Valentine’s Day flowers or giving a floral gift “just because,” take time to personalize your present and make the occasion that much extra special. Gina I just love this idea; absolutely awesome! Thanks for your great ideas Gina! Thanks for the creative juices flowing . . .